This is not a Healthy Smoothie HQ original recipe, but rather the brainchild of the vibrant Kimberly Snyder. This smoothie is so awesome I had to re-post it on my site. What sets this green smoothie apart from the competition is the sheer amount of green vegetables it calls for. Greens are in a class of their own providing an abundance of vitamins, minerals, and overall nutrition. By blending your greens you help break down the cell wall and unlock all the key nutrients for your body to absorb and assimilate. The more green vegetables, green smoothies, and green juices you consume on a daily basis the more your skin will glow with radiance. Kimberly offers a great smoothie tip in her recipe post – make a larger than normal smoothie, drink some, and save the rest for later. If covered and refrigerated, this smoothie will keep for about two and half days. For the original recipe and background information, hop on over to Kimberly’s site by clicking here. 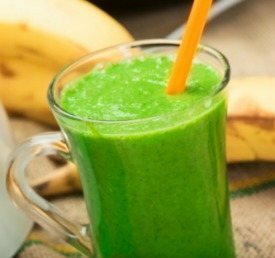 I was made aware of this smoothie after stumbling upon an excellent article by Kimberly, “Healthy” Smoothies that are Actually as Bad as Junkfood. It’s a good reminder and reinforcement that not all smoothies are created equal. I posted a similar article a while back, What Makes a Smoothie Unhealthy? Both articles highlight the ingredients you’re best to avoid adding into your blender. If you’re new to green smoothies you may want to reduce the amount of greens this calls for. Now go make this smoothie and get your glow on! Load all the ingredients into your high speed blender and blend for around 30-45 seconds or until your desired consistency is reached. Please leave a comment below if you try the official glowing green smoothie. Happy Blending! I’ve started drinking Green Smoothies in June , I feel great, blood pressure is way down, I have lots more energy. I feel years younger! That’s awesome Bill! Most people experience a number of health benefits after making green smoothie a part of their daily routine. I feel years younger – now that’s a great testimonial for green smoothies :) Thanks for sharing. I love your site and your messages, Ryan. I’ve had so many good ideas and recipes from you. I started drinking green smoothies every day about four months ago and I’ve noticed a huge difference in my skin, hair, and mood. It makes it so easy to get in enough fruits and vegetables in a day even if the rest of the day isn’t so great. I wouldn’t have thought of adding cilantro if you hadn’t suggested it, but I tried your “tropical detox” recipe a couple of weeks ago and now I’m hooked on cilantro, too. Thank you so much for the kind words about my site and recipes, it means a lot considering the time and effort I’ve put into it. Congrats on your green smoothie transformation! It’s amazing what consuming a healthy smoothie a day can do for your health, physical and mental. Cilantro is a good thing to be hooked on :) There are several greens I overcame aversions to after blending into smoothies. Smoothies are a great way to stay healthy. Try bananas, apple and pears with coconut milk, carrot and red cabbage. I’ve been doing this for 4 months now. Weight is down and I’m not craving for food, it’s so filling. Great to hear you’re thriving on smoothies. Can’t say that I’ve ever used red cabbage in a smoothie, will have to give it a try, along with your recipe. I tried the Official Glowing Green Smoothie Recipe, I had to adjust the recipient I just wanted 1 serving, + no celery. I winged it. 2 & 1/2 cups total greens including parsley, 1/2 a pear, Apple & banana, tsp lemon juice, about 1/2 cup water. I love the bright green color! Tastes fresh & green! This is one I will keep & trying different variations on amounts. I drink 2 green smoothies or juices every day, for last 3 weeks, I can definitely tell a difference in energy & moods. Fantastic, Deanna! Please do modify and adjust the recipe based on your personal preferences. Hi Ryan, when drinking the green smoothies everyday, will you go through a detox stage? If so, what do I need to know about the detox stage. Most people won’t notice any detox symptoms, which might include: skin breakouts, headaches, bloating, fatigue, and irritability. You can drink it daily, Stacey, but it’s probably more economical to drink a couple times a week.